Born in Leeds, England, T.H.P. Lamb emigrated to western Canada in 1891. He worked on a railway construction gang and then became a teacher in the Anglican Indian schools of Cedar Lake, Grand Rapids, and The Pas between 1892-1901. 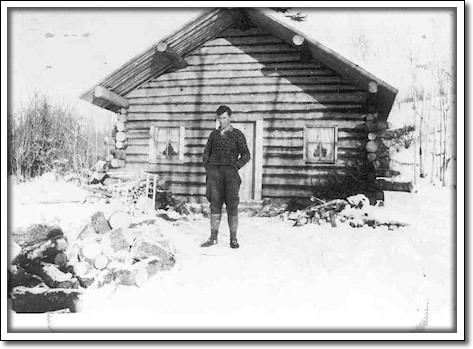 With a growing family to support, Lamb left teaching to establish a fur-trading post at Moose Lake. He also marketed fish, picking up the catch from camps around the lake and shipping them to The Pas. This required him to develop a transportation network, which initially consisted of boats and barges, and later included horses, wagons, and sleds. In 1906 he acquired his first steamboat “The Dispatch” which earned him the nickname “Ten Horse Power” Lamb. In 1927, when T.H.P. Lamb sold the Moose Lake post to his son Tom, the combination of fish, furs, and freighting had proved its worth so well that Tom Lamb junior adapted new technologies to pursue these same objectives.